Christmas Day in Austin saw the release of new films, as well as films that have already been playing in places like New York and L.A. One of those films is Carol, the new and critically acclaimed film from director Todd Haynes. Carol has been a darling with critics ever since its premiere at the Cannes Film Festival in May, where Rooney Mara was awarded the Best Actress prize. As the film has been slowly released around the country since Thanksgiving, the film has been hailed as one of the best films of the year, with numerous nominations at countless awards ceremonies like the Golden Globes. It was definitely one of the last films I wanted to see in 2015 before I put together my best of the year, and Carol is definitely something special. Here’s the review. Cate Blanchett plays the titular character, a woman whose in the middle of divorcing her husband (Kyle Chandler). They have a young daughter together, somebody that means the world to her. When she goes to a department store in Manhattan to shop for her, she crosses paths with Therese (Mara) a young woman who works at the store. When Carol leaves her gloves at the store, and Therese mails them back to her, they begin a relationship of sorts with each other. The film is an examination of their love story, and the consequences of that love story in 1950s New York. Haynes directs a screenplay from Phyllis Nagy, and based on the novel The Price of Salt, which was a popular pulp fiction novel with lesbians in the 1950s when it was released. Haynes, who hasn’t directed a feature film since 2007’s I’m Still Here (also featuring Blanchett) directs a really beautiful and moving love story that also acts as an intimate character piece/study of two women in the 1950s, and how not only lesbians were mistreated during that era, but women in general. I mention this since there’s a subplot from Chandler’s character to have sole custody of their only child, and the court siding with him. It’s a very interesting reminder as to what life was like all those years ago, and how a lot of us were wrong on stuff like that. I really loved Carol, and a lot of it has to do with the performances by Blanchett and Mara, who are both equally brilliant in the film. It feels like ever since Blanchett won her second Oscar for Woody Allen’s Blue Jasmine two years ago that she had graduated from being one of our finest actors working today to maybe the best of the best. It’s a really meaty and heartbreaking performance that she gives in this film, and it would be a travesty if she wasn’t nominated for this incredible performance. This is also the finest performance that Mara has given in her short career thus far. As the quieter of the two characters in the film, Mara portrays Therese as a young and curious woman, and one who doesn’t really like she fits in until she meets Carol for the first time. Their performances, along with the chemistry between the two actors help make Carol be a contender for the best film of 2015. Haynes doesn’t really do anything flashy with his direction throughout the film, as he lets the characters and their actions carry each scene to near perfection. The film is also elevated by Edward Lachman’s beautiful cinematography and Carter Burwell’s eloquently old-fashioned score, which is the finest in its class for the year. What I also really liked about the film is that its running time is right under two hours, and I’ll be honest when I say that slow-moving period pieces like this one can start to make you feel a little restless in the theater, no matter if good or bad. Even though the film is a quietly paced film, you never feel like its going on for too long. It feels like it’s the right pace and runtime, and I never felt like the film dragged for a second during the film, which says a lot. 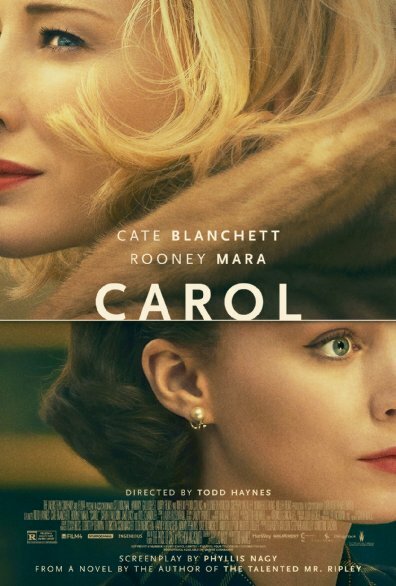 Like The Big Short, which along with Carol are some of the best film options among several during the holidays, if you need a break from Star Wars and want to watch a subtle, beautiful, and heartbreaking character drama, Carol is just the film that you’ve been looking for. I won’t be shocked if Carol is one of the more nominated of the big fall releases at the Academy Awards next month, and when you see the film, you’ll understand why. I should get time to go see The Hateful Eight during the weekend/week, then maybe another film, and then I’ll get you my best of the year, which Carol will have a very cozy spot on that list.